By Spencer Davis. One of the appeals of exploring foreign cinema is seeing how filmmakers from other countries are free to entertain story ideas that would never get the green light in Hollywood. It’s not necessarily that foreign directors are given more leeway to take risks; it’s that a plot device that seems absurd to us may, in the eyes of another culture, make total sense. With that in mind, let’s look at five more pictures from around the globe that redefine the boundaries of what movies can do. L’Avventura (1960): Michelangelo Antonioni is about as unconventional a director as you’re likely to find. A man way ahead of his time, his camera techniques look utterly modern, and his stories—often focusing on the ennui and moral emptiness of twentieth century life—have a sense of cynicism that you don’t expect from late 50s and early 60s film. L’Avventura is the first in a trilogy on the romantic discontentment of the post-war generation, but while that theme remains a constant, it plays against the backdrop of a mystery that sounds straight out of Hitchcock. While on a Mediterranean boating trip with friends, a young woman disappears—and as they take on the search, her best friend and lover begin to question whether all is as it seems. I won’t ruin what happens from there, except to say that Antonioni’s resolution breaks every rule of Hollywood screenwriting. And his cinematography captures the barren Italian landscape as a mirror for the emotional isolation of his characters, cutting deep into a set of very flawed people as their search leads them to places they never wanted to go. Featuring Monica Vitti in a star-making performance that shows that complex female roles aren’t an entirely new invention, L’Avventura is a movie that stands defiantly outside of its own time. Band Of Outsiders (1964): When Quentin Tarantino launched his first production company, A Band Apart, the name was a play on this landmark film from French director Jean-Luc Godard. And that’s utterly appropriate, because in Bande a Part (as it’s called in its native language), you can see the early prototype for the kind of off-kilter cool that would define films like Pulp Fiction and Reservoir Dogs. There’s the plot, which naturally focuses on a group of amateur thieves. There’s the iconic cafe dance sequence, placed there for no other apparent reason than to exude style. There’s the quirky humor and pop cultural references that turn an unremarkable heist picture into something fresh and provocative. Godard was a film critic before he was a director, and having digested so much cinema in that role, his movies would reject the realism that was then coming into fashion in favor of something more heightened—the notion of a movie that knows it’s a movie, that consciously aspires to be something flashier and cooler than the real world. In doing so, he created a new film language that dominates our movies to this day. The Battle Of Algiers (1967): The danger of making a political movie is that it can all too quickly lose its relevance as history moves on. But The Battle Of Algiers, set though it may be in a conflict that few Americans have even heard of, took four decades to reach the height of its influence. That’s because it may be the smartest movie about the war on terror ever made. Shot like a documentary by Italian director Gillo Pontecorvo, it records the failed efforts to quell the violent insurgency that drove the French military out of Algeria in the late 50s and early 60s. As the terrorist bombings lead to military crackdowns that only inspire more terrorism, we see the futility of security through force; at the height of the Iraq War, the Pentagon actually used the film as an example of what not to do. What makes the film so remarkable from the perspective of a modern viewer is how the lens treats neither side as heroes or villains. We see Muslims portrayed both as terrorists and victims, and we see the military as both protector and oppressor. If the film has a moral judgment to offer, it’s that violence becomes a cycle. A half-century later, we’re still learning that lesson. 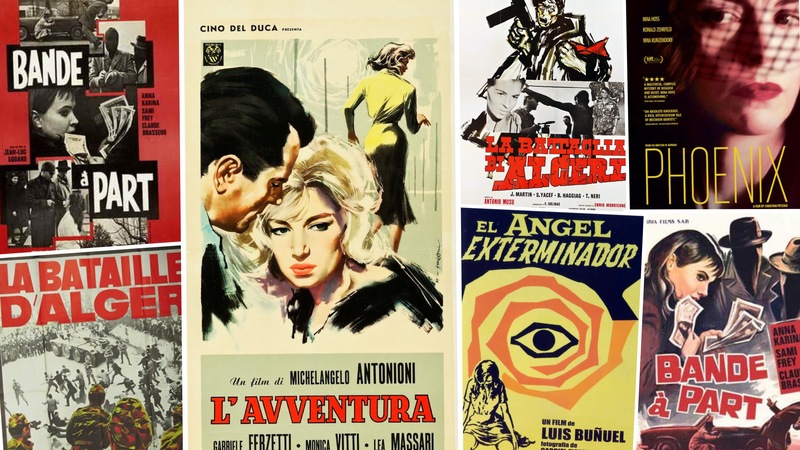 The Exterminating Angel (1962): Fans of David Lynch’s Twin Peaks revival may want to check out a much earlier example of surrealism on film in Spanish director Luis Bunuel’s late era masterpiece, The Exterminating Angel. You might remember a scene in Woody Allen’s Midnight In Paris when Owen Wilson pitches a young surrealist filmmaker an idea for a movie where a group of socialites sits down to dinner and then, for reasons unexplained, is unable to leave? That young filmmaker was Bunuel, and the film Wilson was referencing is every bit as weird as it sounds. As the guests gradually panic, fight among themselves, struggle for food and water, and descend into anarchy—all over a trap that, from our perspective, is purely in their own minds—Bunuel uses the ridiculousness of the situation as the ultimate satire on class, political systems, religion, psychology, and modern disillusionment. Shattering the line between comedy and horror, between highbrow and lowbrow, The Exterminating Angel is unlike any other movie you’ve ever seen. If it doesn’t remotely make any sense, that’s just because neither does the world on which it’s commenting. Phoenix (2014): It’s a concept that requires a certain suspension of disbelief: a German woman disfigured at Auschwitz has facial reconstruction surgery and returns to Berlin to find the husband who may have betrayed her to the Nazis. While that description might give you flashbacks to the Cage/Travolta action flick, Face/Off, rest assured that Phoenix plays more like a forgotten Alfred Hitchcock classic, as secret identities compound into a complicated game of subterfuge when her husband unknowingly recruits this “stranger” to pose as his dead wife in a scheme to draw upon her inheritance. Implausible plots like this were all too common in 30s and 40s Hollywood thrillers, but it wouldn’t work today if not for a seriously killer performance from Nina Hoss, who has to play a person pretending not to be the very person she is pretending to be—and she nails it. With a script that slowly ratchets up the tension and a finale that quietly stuns, it’s a film that smartly straddles language barriers and historic eras alike. For more foreign film recommendations, continue to follow this ongoing series, as well as our past series on the World Cup Of Cinema.